So you are considering using homeschool unit studies to teach your children. I feel that this is a good choice. I have always loved themed based learning especially when I had young children. Combining Bible, history, reading, writing, and maybe science just made sense to me. I have also read that children learn more when they do themed based learning. I guess that there is more learning hooks. Here are some other benefits that I have come up with. When everyone is studying the same theme school becomes family time. You are making lasting memories. My children still remember learning about Lewis and Clark and then going to the Interpretation Center on the Oregon coast. Do you have a large age span between children? One thing you can do is to have everyone present when you read aloud. Preschoolers can color while they are listening to the stories or information. Dover Publishing Company has coloring books on lot of different subjects. If you cannot find coloring books you can have your child play quietly with small toys. Are you studying about dinosaurs? Have your young child match the toy to the dinosaur talked about in the book. Think of other ways that you can incorporate toys into learning. Another idea is to have the older children teach the younger ones. Your child will learn a lot by teaching. They can read books to their younger brothers and sisters. Older children can also discuss what they are learning with the younger children. Everyone can do projects and go on field trips together. A unit study can spark the interest of a child who struggles with learning. If your child is interested in trains you can build a unit about trains. He will learn history and geography. You can study how trains helped improve the quality of life for people. 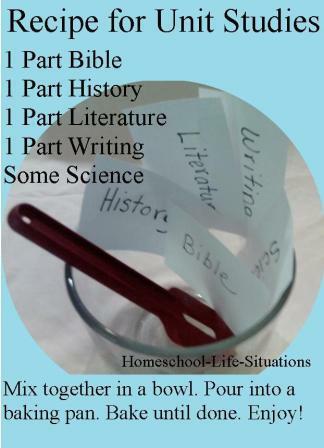 When doing a homeschool unit study a child can be given options for learning activities. They do not have to fill in the blanks on a worksheet or write an essay. Before my children could write well, we discussed what we learned orally. I would ask questions and they would give the answer orally. Did you know that homeschool unit studies are beneficial for all learning styles? I have a daughter that is a visual learner. For her I find movies and other ways to present the information visually. You can find documentaries about almost any subject. If your child wants to learn how something was done or made look for You Tube videos. If you don't want to read a classic, then find a movie. The only caveat is to find movies that follow the theme of the book. Field trips are beneficial for children who are either a kinesthetic/hands-on learner or visual. Auditory learners can benefit from hearing books read aloud and lectures. I used the Weaver when my children were young. One of the things that I liked about the Weaver was that it went through the Bible. I still think that it is important to teach a biblical worldview. If you or your child becomes bored with doing workbooks then you can try a unit study. There are many themes today that you can do in a week's time. One of my children enjoyed writing short stories. Other children might like writing poems, plays, or essays. There are many themes available. You and your child should be able to find something that will spark and interest. You can find studies for preschool through high school. I feel that homeschool unit studies can save you money. Most textbooks are expensive. With unit studies I can use fee reference materials from the library and internet. I only have to pay for the unit study. Most studies are reasonably priced. Well I should mention that homeschool unit studies are not for everyone. Some people are worried about evaluation. Most of the time you will not be giving multiple choice and fill in the blank tests. Hands-on projects, essays, and other creative student activities are harder to score. You will have to subjectively determine if your child learned the information. Homeschool unit studies take more teacher time than having your child work out of a workbook. But I feel that the time it takes for me to teach is well spent learning along with my child. I really feel that the advantages outweigh the disadvantages when using homeschool unit studies. I hope that you do too.